Postdoctoral fellows are the engine that runs scientific discovery in the U.S. But our next generation of brilliant researchers is facing a challenge that their institutions are ill equipped to address–parenthood. 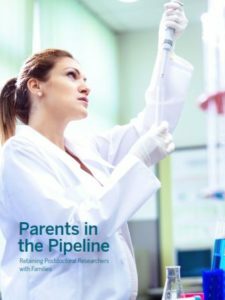 Based on institutional data and a survey of nearly 1,000 postdoc parents, Parents in the Pipeline: Retaining Postdoctoral Researchers with Families sheds new light on the impact that parenthood has on the postdoc experience, and what institutions can do to keep postdoc parents in the STEM pipeline. Examples and recommendations on how institutions can better support postdoc parents and reduce liability.